Sacroiliac joint pain is a quite common causes of low back pain. Sacroiliac joint pain can be very painful but it is not usually serious and responds well to Osteopathic treatment. 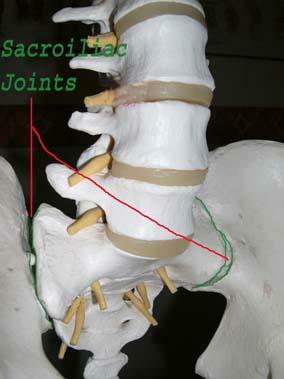 The Sacro-iliac joint or "S.I." joint is the joint between the large triangular bone at the base of the back and the large Ilium bone of the pelvis. The joint can be seen as 2 small dimples on each side of the lower back above the bottom. The SI joint moves only slightly in a number of planes, allowing a twisting, shearing and tilting motion.It moves more in ladies than men perhaps because it plays an important role during childbirth. It is held together by many large fibrous bands called ligaments. There are many different reasons for SI joint pain. Pregnancy is a factor in the development of SI joint problems as the ligaments that hold the joint together become stretchier at this time to allow more movement of the joint, to allow the baby to pass through the pelvis at birth. After childbirth, if the S.I. joint "sets" in a twisted manner it can lead to an apparent leg length difference, which may lead to uneven weight bearing through the legs and the development of hip arthritis later in life. Many of us have one leg longer than the other and this can lead to uneven strains going through the SI joint and lead to pain. If prolonged wear and tear occurs to the SI joint then Osteoarthritis can develop in the joint itself. This may be more likely in the more mobile joints, particularly in women. Many other diseases can affect the SI joint such as Ankylosing Spondylitis, Rheumatoid arthritis and infections. Trauma from a fall or athletic injury can commonly affect the joint as can a major trauma from a road traffic collision. Your Osteopath will take a careful case history and then examine you in great detail, noting your ranges and quality of movement. He will do minor tests for trapped nerves and in rare cases may request an X ray or MRI scan. When a diagnosis has been reached, your Osteopath will discuss the treatment options with you. Although SI injuries can be painful, the vast majority of injuries are not serious and can easily be helped by your Osteopath. He should normally be able to reduce your symptoms to a pain-free level and give you advice and exercise to help prevent future problems. It is better that you seek advice sooner rather than later because apart from getting an accurate diagnosis, evidence shows that the sooner you consult your osteopath, the quicker you will be better! This is one of the common conditions that Osteopaths treat and nearly always a patient can be helped by carefully prescribed Osteopathic treatment and advice!